For years, Cresencia (family name withheld upon her request) has had problems with her stomach. She was found to have gastric cancer, a disease that usually grows slowly over many years. Badly wanting to be healed, the 60 year-old mother of three traveled all the way from Bilar town to Tagbilaran City last Tuesday when she learned that the image of the Blessed Virgin Mary of Lindogon Simala arrived in Bohol on Monday. She said it was an opportunity for her to see the image in Tagbilaran since it was costly for her to travel to Cebu. Pilgrims visit Sibonga town in southern Cebu to visit the Our Lady of Lindogon Shrine, in the hills of Barangay Simala. Cresencia did not mind the distance, firm in faith that she will be healed by God through the intercession of the Blessed Virgin Mary. “Nag-ampo ko nga hikapon ko para ayuhon ko niya sa akong balatian,” Cresencia said as tears welled up in her eyes. She was accompanied by one of her grandchildren in her trip to the Our Lady of Barangay Shrine in Barangay Cogon. Cresencia had to endure for at least four hours under the heat of the sun outside the church until she was able to come close and touch the image of the Virgin Mary inside a glass. A sea of people covered some streets of Tagbilaran when the Our Lady of Simala passed by during the procession. 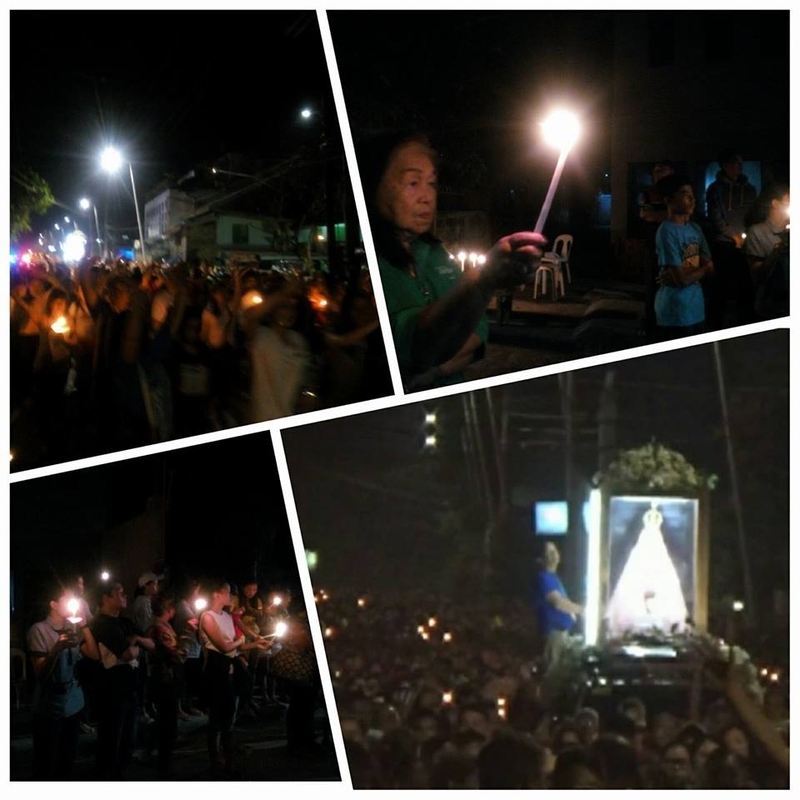 Along the streets, devotees lighted candles while praying for the Virgin Mary. Among those who waited was Wincesa Espejo-Araoarao, founder of Bukang Liwayway Dance Troupe, the longest surviving folkloric group in Bohol. “I feel I am blessed that she passed our place,” said Araoarao, who visited the Lindogon Shrine 10 years ago. “And I hope and pray that all what we pray for will be granted through her intercession,” she added. Another devotee Wilma Diez-Balag was overwhelmed of the Virgin’s visit to Bohol. “Daghan kaayong salamat Mama Mary sa Lindogon Simala sa pagbisita namo imo gyung gipakita namo kon unsa ka kamilagrosa ug kabalaan nakita gyud namo ang imong balaang mga luha.. VIVA MAMA MARY,” she posted on Facebook. She used the hashtags #loveumamamary #ayawmikalimtikangjesus and #congratulationtousblueladies. In Cebu, thousands of devotees troop to the shrine in Simala which the devotion to the Blessed Virgin Mary in Simala started sometime in 1997. The image was given to monks of the Frater Martin Mary by an unknown woman at the height of the lahar destruction in 1991 in Pampanga. In 1996, the monks moved to Cebu with the image of the Blessed Mother with permission of then Cebu Archbishop Ricardo Cardinal Vidal. Since then, a lot of people find bliss and healing with proofs displayed at the shrine’s museum. Last Monday was focused on environmental issues and concerns. Government officials, volunteers and residents joined a coastal cleanup on Panglao Island, one of the country’s favorite tourist destinations plagued with environmental problems. Hundreds of volunteers composed of students, the public and authorities gathered on Panglao beach early Monday to collect garbage at the coastlines. Among the trash they picked up were cigarette butts, plastic beverage bottles and other plastic containers. At least 400 business establishments in Panglao, including illegal settlers, were found to have been violating environmental laws during a validation conducted by the Environmental Management Bureau (EMB) of the Department of Environment and Natural Resources (DENR) and the municipal governments of Panglao and Dauis. The Monday afternoon news was shocking. Two workers- Ariel Abac and Valeriano Galeya- were buried in a landslide at a quarry in Sitio San Isidro in Barangay Candabong in Anda town, at least 5 km from the town proper. “Alerto” Jun Gutierrez of dyRD who was quick at the site gave listeners the most comprehensive, blow by blow report of the progress of the operations. When I visited the site on Tuesday afternoon, KC Peñaranda-Abac, wife of Ariel, said she remained hopeful her husband was alive because his phone was still ringing when she called his mobile phone on Tuesday, more than 12 hours after the landslide occurred on Monday afternoon. KC, 25, said her intuition told her that her husband Ariel, who was working at the quarry for nine months, was still alive even if they were believed buried. “Naglaum ko nga buhi pa siya (I am still hoping he is alive),” she said as she watched a group of rescuers frantically digging through the debris with the help of shovel in the area believed they were buried. “His three children are waiting for him,” she added. Abac’s brother-in-law Ramon Peñaranda said they were at the quarry site gathering “anapog” (limestone) on Monday afternoon. When he took a break and left the group, he heard a big commotion. He said Galeya and Ariel, who were digging at that time, didn’t notice that big rocks as big as a barangay hall had rolled down toward them, followed by a mass of soil. When the landslide hit, he added, smog and dust covered the entire place for half an hour. Ramon, 48, said Ariel and Galeya may have been buried in a pile of soil at least 12 feet tall. A mini dump truck near the victims was completely covered. But Ramon said that while he believed the two would not have survived the landslide, he wanted to recover the body to give them a proper burial. Rescuers had difficulty digging due to the huge rocks. Anthony Damalerio, head of the provincial disaster risk reduction management office (PDRMMO) said that rescuers from neighboring towns of Pilar, Alicia, Ubay, Candijay, Guindulman and Duero went to the site to help for the search and retrieval operation. Additional volunteers from the Philippine Army and Philippine National Police arrived on Tuesday afternoon. Tarsier 117’s training headed Mark Sidney Galia said the soil may have cascaded due to intermittent rains brought by typhoon Basyang. The search and retrieval operations on Monday and Tuesday nights were stopped for safety reasons. Rescuers found the bodies of the two workers on Wednesday morning. The mountain in Candabong was a known quarry site for limestone. On August 27, 2011, two were killed and one was injured in a landlslide at the same quarry. Killed were Romeo Galos, Jr., 14 and Eric Bernil, 21. Mark Jerico Alaguer, 13 sustained severe injuries. Anda, about 99 km from Tagbilaran City, is an alternative destination in Bohol province because of its white sandy beaches and cavepools. Totsie Escobia, provincial information officer, said the municipal government had stopped the quarry because the area is one of those identified as landslide prone. He added that some residents continued to defy the order and continued to quarry for limestone for livelihood. Escobia said that the provincial government is looking into the situation, urging the local government units for strict compliance on quarry laws.